For those who don’t know yet, Smashing Magazine is arguably one of the most popular blogs for web designers and developers, informing the readers about the latest online trends and techniques. The Zitec Design Department wanted to prove the world that is good enough to be featured on Smashing Magazine, Desktop Wallpaper Calendar monthly edition. Well guess what! Our designer, Adrian Limbasan, was the most motivated and reached the place that others only dream about :). 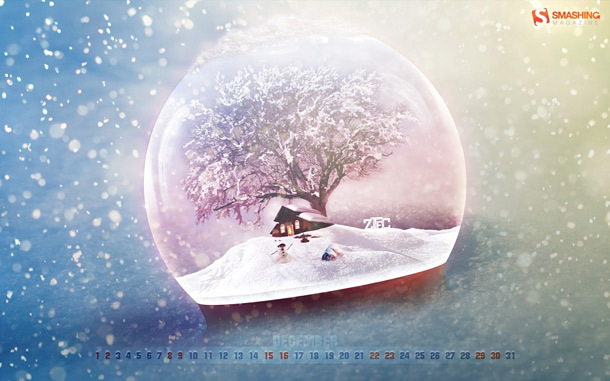 He was selected and featured on the “Desktop Wallpaper Calendar, December 2012 (Christmas Edition)” post with his artwork – “Frosty Globe”. Way to go Adi, thank you for making us proud of you! Click here to see all the featured artworks ». Thanks for the fantastic submission, Adrian — we are looking forward to more submissions from you guys next year!